United States President Barack Obama (left) and Prime Minister Datuk Seri Najib Razak at a press conference in Kuala Lumpur yesterday. 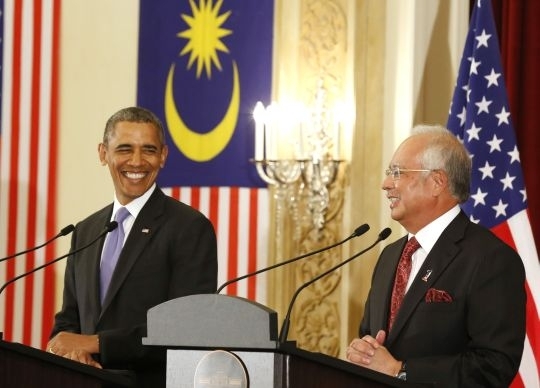 The American president praised Najib for being a reformer. – Reuters pic, April 28, 2014. It is simple, really. You are either for human rights and civil liberties or you are not. The minute you preface your answer with “in principle” when talking about human rights and civil liberties, you are no longer a man of principle. Prime Minister Datuk Seri Najib Razak yesterday gave the world a nice look at his so-called reformist credentials. Sharing the stage with President Barack Obama at a press conference, he and the American leader were asked questions by the foreign press on Malaysia’s patchy human rights record. “President Obama and I are both equally concerned about civil liberties as a principle, ” said Najib. As a principle? Note to Najib: you either are committed to upholding civil liberties or you are not. Memo to Obama: obviously Najib was not listening very carefully to you when you pressed him about Malaysia’s human rights and civil liberties record during bilateral talks. The US president and his officials at the United States embassy in Kuala Lumpur must be on magic mushrooms. There has been a complete disregard for civil liberties in Malaysia and this is best exemplified by the manner in which sedition charges were brought against the late Karpal Singh and a host of other opposition politicians. Najib and Obama talked up Najib’s so-called reforms when the former came to office. Guess what? That was window dressing and nothing more. The Internal Security Act (ISA) was repealed and it has been replaced by another law that allows for detention without trial. The Peaceful Assembly Act (PAA) may have been well intentioned but it has been a joke with the government, police and government agencies doing their best to frustrate any public show of discontent. Mind you, even after the Court of Appeal handed down a landmark decision on the legislation last week and cleared the way for the public to assemble, Home Minister Datuk Seri Ahmad Zahid Hamid was warning of a crackdown against the anti-GST (goods and services tax) rally on May 1. Pulled back? Unlikely. Everything about the PM is about point-scoring. He introduced some reforms in the hope that it would give him a lift among the chattering classes. When it didn’t, he fell back into the embrace of Umno. A real reformer plods on, and tries to convince his doubters and critics. Someone who only believes in civil liberties “as a principle” tends to blow with the wind. Sound familiar? – April 28, 2014.